Original book cover design by Oklahoma artist Kalyn Fay Barnoski. 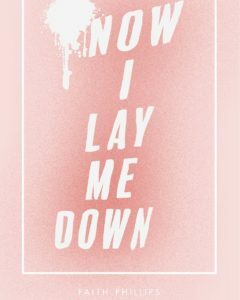 This is your exclusive first look at the true crime novel Now I Lay Me Down, the third book from author Faith Phillips. Sign up with your email at http://readbooksby.faith/ to be notified when the book becomes available for purchase. You can be the first to order your copy of this riveting summertime page turner! The prosecutor stood in the road. She surveyed the scene and said not a word. A denim blouse hung loose on her slender frame. She stared at the ditch, one hand shoved deep in her back pocket. She remembered. This particular stretch of County Line Road had once been an obscure place in an obscure county, familiar only to the few locals who made their homes on the back road. Obscurity is just another way of saying concealed, and the town of Weleetka meets that definition. Interstate 40 runs just a few miles north as the crow flies, ferrying interlopers past long-forgotten Oklahoma towns. It is very much concealed and out of view, hidden by stands of trees in rural Okfuskee County. An outsider would never expect to come across a town in this pastoral location. Out of sight, out of mind. The quiet lane that runs through Okfuskee County’s back country is populated by trees, underbrush and an occasional family home. The lawns often hold collections of defunct automobiles and plastic toys left out to fade in the weather. Maxey Parker Reilly hadn’t been sure she could find her way back again without some sort of navigation. It had been such a long time since she last visited. She careened her S.U.V. along the blacktop and slowed at each turnoff, eyeing the road signs. But when she came to County Line Road the physical reaction was instant. Total recall took hold and she cut a sharp right. She didn’t need to look for signs now. She remembered. The topography along the road was flat and tree-lined, strewn with thick underbrush. Stationary oil wells provided a gaudy juxtaposition to the otherwise quiet countryside. After a couple of miles hints of color appeared in the ditch like a mirage. Glints of sunlight reflected from multiple points of glass and metal. At first glance it appeared as though flowers had managed to spring up and out of the drab undergrowth. But then a fraction of light angled down from a tree limb, and a plastic whirligig spun in the wind. Then came the teddy bears at the heart of the place, long worn by exposure. Wind chimes played a hollow tune and a light bulb hung from a tree. The dusty white crosses finally identified the place as a roadside memorial. They are a familiar sight along Oklahoma’s highways; a family’s way of marking the mournful spot where a loved one drew their final breath in a violent clash of glass and steel. But this roadside memorial was atypical. Small details indicated something very different from a car crash. An American Girl doll with long dark hair and platform heels lay smiling in the dirt. It was the first hint that something might have happened to a little girl here. In the midst of all the odd memorial objects an angel arose. She stood, once gleaming white, now covered in layers of dust thrown up by passing vehicles. The statue as it stood that day was four feet in height; an elegant effigy with shoulders proud and tall; folds in the long ceramic robe revealed a bent knee. The delicate wingtips of the angel nearly touched the ground. At her bare feet a ceramic puppy and a smiling bear sat on guard next to a basketful of plastic lilies and sparkling beads. The angel cradled a great bouquet of field daisies across her chest. The statue’s presence represented a statement to onlookers. Someone had cherished the person who was lost in this place. The angel was carefully chosen to memorialize a child. It was meant to solemnize and express community grief. They placed her at the center of all the other tokens of loss left behind. But then someone came along, pointed a shotgun at the angel’s head and blasted it clean away. It was not the first time the memorial had been violated. Maxey was filled with emotion and anger at the sight of it. Snapshots flashed in her mind from a hot summer evening ten years previous. That night she had been called away from her newborn child to this place on County Line Road. It was one of her very first jobs as the new Okfuskee County Assistant District Attorney. Fresh out of law school, she had imagined that her first case might be a drug prosecution or perhaps domestic violence. But the pretty young woman was afforded no chance to ease herself into the prosecutor’s role. She had been thrown in the deep end by the brutal execution of two little girls on County Line Road, just a few miles outside of Weleetka, and she had no other choice but to swim.